Opéra Bastille in Paris is one of the two main venues of the Opera National du Paris, France’s principal opera company (the other venue is the prestigious Opéra Garnier). Designed by Uruguayan architect Carlos Ott and located at the place de la Bastille, the building houses a 2700-seat theatre as well as a smaller concert hall and studio. Part of president Francois Mitterrand’s ‘Grands Projets’, Opéra Bastille was one of eight iconic building projects begun in the 1980s to revitalise Paris and create modern ‘monuments’ to symbolise France’s role in art, economics and politics at the end of the twentieth century. The scale of Mitterrand’s project was compared at the time to the major building schemes of Louis XIV and as such, The Bastille Opera house constitutes part of one of the most important post-war examples of urban planning in Europe. It was into this auspicious setting that GDS was invited to provide a solution to a problem that was a plague upon the musicians of the Opera - that of rehearsing in an excessively hot environment. 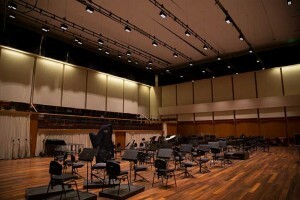 The Liebermann Room at Opéra Bastille provides an ideal rehearsal setting for musicians and choirs alike but in summer the perennial problem of overheating had reached a point where action had to be taken. A combination of air-conditioning inefficiencies and 49 duo PAR 500W lamps conspired to leave the musicians in great discomfort. The colour temperature of the light was a consideration when planning for the replacement fittings, as the musician’s score which is produced in two different colours, white and a yellow tone, needed to be clearly legible under the new light and a minimum of 800LX light level was required. With no budget for additional control cabling a suitable wireless solution was required. At the request of Didier Paillet, head of lighting services, GDS’ French distributor Alterlite was invited to supply GDS ArcSystem to solve what had become, over a number of years, an intolerable problem. GDS supplied 49 ArcSystem Pro Fixture 8 cell 3000K 37 Degree Black Yoke fittings with a single TX1 master transmitter to replace the existing lamps. It would not be an overstatement to say that ArcSystem erased almost ten years of suffering at a stroke. 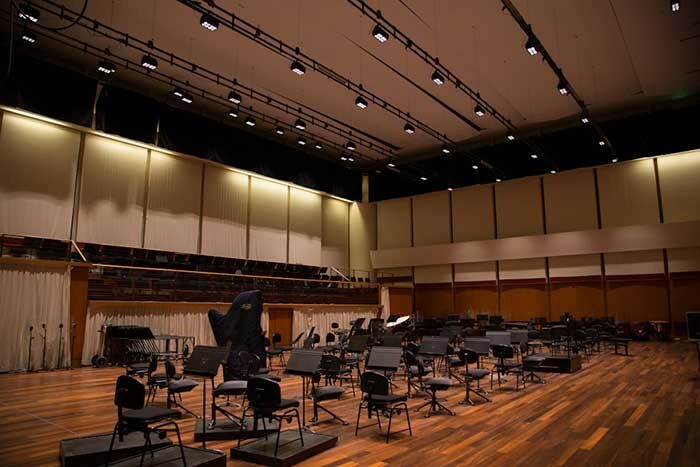 From a situation where the existing lights were using 49KW of energy (much of which was generating heat), the installation of ArcSystem reduced this by more than 80% to a mere 7KW whilst providing light levels of 800 – 1000LX and the perfect colour temperature for the musicians to read their scores. The simultaneous vast improvement in light quality from the LED fittings was coupled with further reductions in energy consumption related to the previously overworked air-conditioning system. ArcSystem thus readily met the requirements of the brief. The high output to low energy ratio of ArcSystem was brought sharply into focus in the Liebermann Room. In this case its efficiency and sustainability could be seen to positively address both micro and macro environmental issues, whilst significantly improving cost-effectiveness. ArcSystem provided seemless wireless control, with no additional cabling costs and allowed greater flexibility with independent section control no hot spots or LED derating and silent operation. Ease of installation and low-maintenance further underpin the credentials of this versatile and flexible product. The installation of ArcSystem at Opéra Bastille has transformed the working experience of the musicians rehearsing in the Liebermann room. Head of lighting Didier Paillet was happy to report: "I was very impressed with the ArcSystem 8cell, the colour temperature, stable wireless control and dimming ability in such a compact unit. It was the solution to all our problems and those that we didn’t know we had." Lionel Garraud from Alterlite added: "GDS came to site to help with the initial proposal and specification of fittings, we were very happy to offer this as their distribution partner for France knowing that the installation would be a seamless replacement and would deliver all the benefits that The Bastille was looking for."